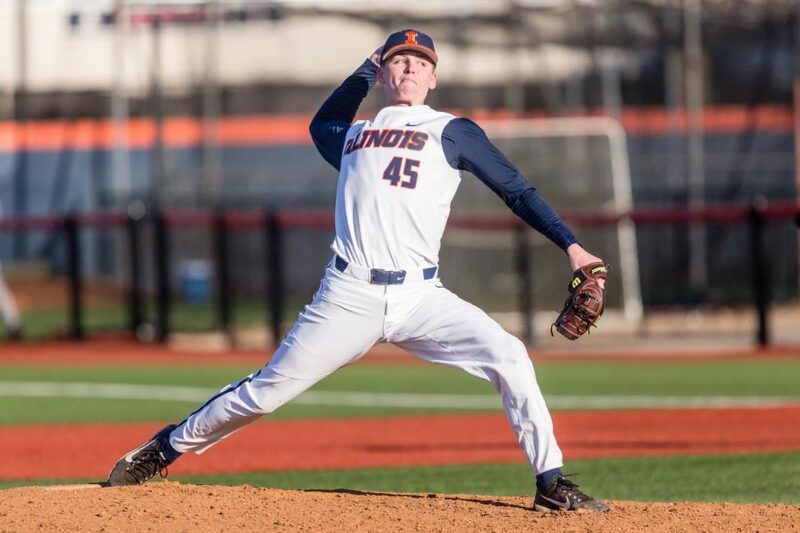 Illinois pitcher Ryan Thompson (45) delivers the pitch during the game against Milwaukee at the Illinois Field on Wednesday, March 14, 2018. 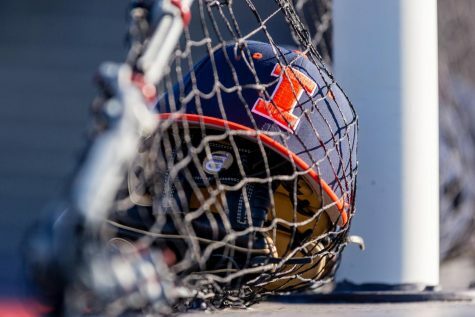 Illinois and Illinois State were supposed to have a home-and-home this season, but due to cold temperatures, the two teams were only held to one meeting. 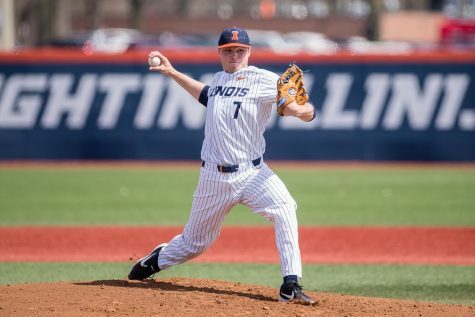 On Tuesday evening at Illinois Field, the Illini made sure they’d have bragging rights over their in-state rivals, locking in a 4-2 victory in what will be the only meeting between the two sides this season, unless the two programs decide to schedule another midweek contest on their open dates in May. 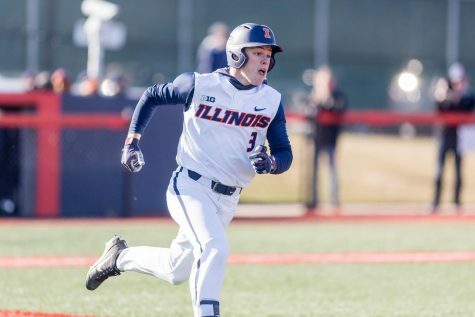 The Redbirds got on the board first with a sacrifice fly in the second, and though the Illini answered with two runs of their own in the bottom frame of the inning, Illinois State looked poised to do damage, with the bases loaded with one out in the fourth. Illinois pulled out freshman right-hander Ryan Kutt (1.0 IP) in favor of left-handed sophomore Zack Jones. Jones delivered, getting the Redbirds to ground into a double play to end the inning. 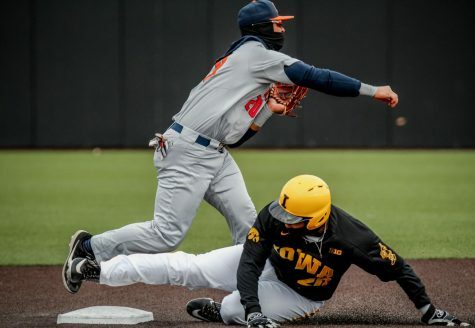 It was all the team needed to keep Illinois State off the board for the remainder of the contest, as the Redbirds’ Connor Peplow hit both third baseman Grant Van Scoy and centerfielder Zac Taylor with pitches back-to-back. Then, he walked shortstop Ben Troike to load up the bases before Bren Spillane (1-for-4) drove Van Scoy home with an infield single to short. Sophomore second baseman Michael Massey came up and flew out, but Taylor was able to tag from third and score to make it 4-2. Jones dispatched his way through the Redbird lineup, only allowing one hit and striking out three of the 12 batters he faced before he was relieved by right-handed pitcher Quinten Sefcik in the eighth. 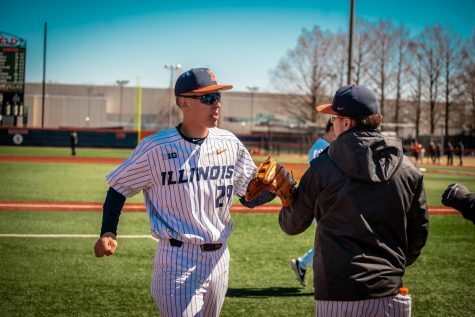 Head coach Dan Hartleb was happy with his pitching staff’s effort on the day, particularly in lieu of being outhit 9-6 by Illinois State. He pointed to the bases-loaded situation where Jones came in as a turning point. 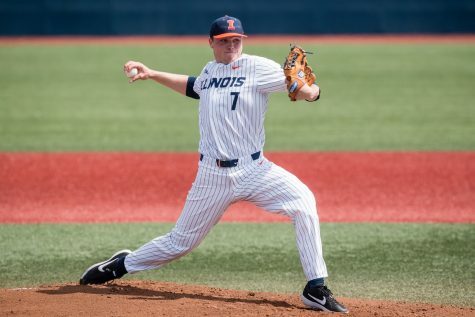 The Illini were not threatened for the remainder of the game, as Sefcik only allowed one Redbird on base and closer Joey Gerber shut down Illinois State in the ninth. 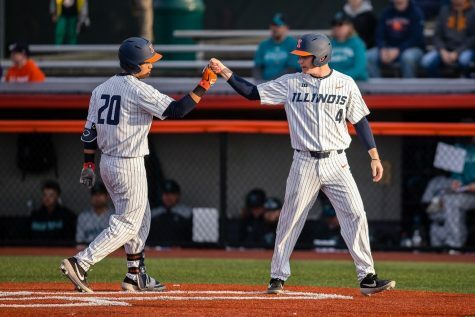 With red-hot Bren Spillane taking a slight dip in form over the past several games, the Illini relied on some hits at key moments from right fielder Jack Yalowitz (.204), catcher Jeff Korte (.213) and Van Scoy (.259). 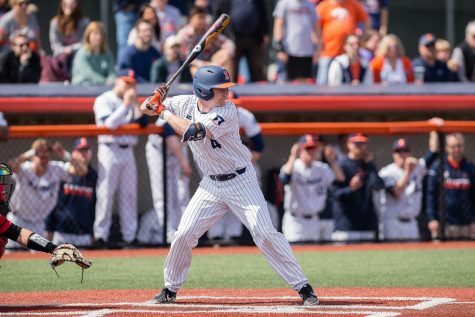 Production across the board has been a talking point for Hartleb’s team this season, and the Illini benefitted from getting hits from its lower-percentage hitters on Tuesday. 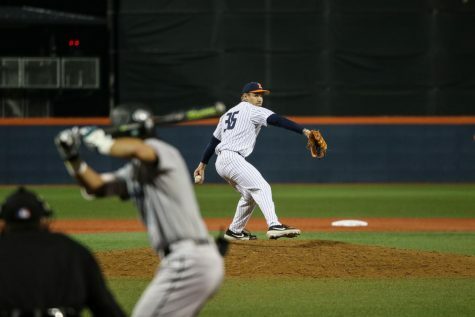 For Jones, who earned his second win of the year (2-0), getting a variety of his pitches on the mark helped to keep Illinois State batters from reaching base. When he entered the game, his intention was just to get the ball in the strike zone and make batters put the ball in play. Jones, who grew up in Downers Grove, Illinois, has a lot of friends who go to school at Illinois State. 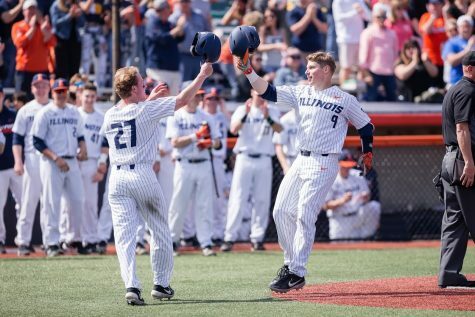 Beating an in-state rival is usually a bonus for programs, but for Jones and many of his fellow in-state Illini products, the win is sweet, especially since it will likely end up as the teams’ only meeting this year.